On Wednesday I told you about the New Year, New Year deals at Amazon.com with Up to 50% off fitness DVDs, 20% off select athletic shoes and Books on dieting, fitness, and healthy eating. 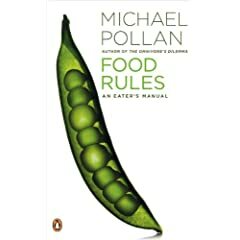 In that post I also mentioned Michael Pollan’s In Defense of Food: An Eater’s Manifesto and The Omnivore's Dilemma. Well, I just found out that they have his newest book, Food Rules: An Eater's Manual on sale for only $5 - SCORE! I'm not sure how long the promotional price will last - I would recommend getting it now if you're interested.